A kitchen is a room or part of a room used for cooking and food preparation in a dwelling or in a commercial establishment. A modern middle-class residential kitchen is typically equipped with a stove, a sink with hot and cold running water, a refrigerator, and worktops and kitchen cabinets arranged according to a modular design. Many households have a microwave oven, a dishwasher, and other electric appliances. The main functions of a kitchen are to store, prepare and cook food (and to complete related tasks such as dishwashing). The room or area may also be used for dining (or small meals such as breakfast), entertaining and laundry. The design and construction of kitchens is a huge market all over the world. The United States are expected to generate $47,730m in the kitchen furniture industry for 2018 alone. Commercial kitchens are found in restaurants, cafeterias, hotels, hospitals, educational and workplace facilities, army barracks, and similar establishments. These kitchens are generally larger and equipped with bigger and more heavy-duty equipment than a residential kitchen. For example, a large restaurant may have a huge walk-in refrigerator and a large commercial dishwasher machine. In some instances commercial kitchen equipment such as commercial sinks are used in household settings as it offers ease of use for food preparation and high durability. In developed countries, commercial kitchens are generally subject to public health laws. They are inspected periodically by public-health officials, and forced to close if they do not meet hygienic requirements mandated by law. Freed from smoke and dirt, the living room thus began to serve as an area for social functions and increasingly became a showcase for the owner's wealth. In the upper classes, cooking and the kitchen were the domain of the servants, and the kitchen was set apart from the living rooms, sometimes even far from the dining room. Poorer homes often did not yet have a separate kitchen; they kept the one-room arrangement where all activities took place, or at the most had the kitchen in the entrance hall. In Connecticut, as in other colonies of New England during Colonial America, kitchens were often built as separate rooms and were located behind the parlor and keeping room or dining room. One early record of a kitchen is found in the 1648 inventory of the estate of a John Porter of Windsor, Connecticut. The inventory lists goods in the house "over the kittchin" and "in the kittchin". The items listed in the kitchen were: silver spoons, pewter, brass, iron, arms, ammunition, hemp, flax and "other implements about the room". Separate summer kitchens were also common on large farms in the north; these were used to prepare meals for harvest workers and tasks such as canning during the warm summer months, to keep the heat out of the main house. In the southern states, where the climate and sociological conditions differed from the north, the kitchen was often relegated to an outbuilding. On plantations, it was separate from the big house or mansion in much the same way as the feudal kitchen in medieval Europe: the kitchen was operated by slaves in the antebellum years. Their working place was separated from the living area of the masters by the social standards, but more importantly, it was a means to reduce the chance of fire in the main house from kitchen operations. Technological advances during industrialisation brought major changes to the kitchen. Iron stoves, which enclosed the fire completely and were more efficient, appeared. Early models included the Franklin stove around 1740, which was a furnace stove intended for heating, not for cooking. Benjamin Thompson in England designed his "Rumford stove" around 1800. This stove was much more energy efficient than earlier stoves; it used one fire to heat several pots, which were hung into holes on top of the stove and were thus heated from all sides instead of just from the bottom. However, his stove was designed for large kitchens; it was too big for domestic use. The "Oberlin stove" was a refinement of the technique that resulted in a size reduction; it was patented in the U.S. in 1834 and became a commercial success with some 90,000 units sold over the next 30 years. These stoves were still fired with wood or coal. Although the first gas street lamps were installed in Paris, London, and Berlin at the beginning of the 1820s and the first U.S. patent on a gas stove was granted in 1825, it was not until the late 19th century that using gas for lighting and cooking became commonplace in urban areas. The Frankfurt Kitchen of 1926 was made of several materials depending on the application. The modern built-in kitchens of today use particle boards or MDF, decorated with a variety of materials and finishes including wood veneers, lacquer, glass, melamine, laminate, ceramic and eco gloss. Very few manufacturers produce home built-in kitchens from stainless-steel. Until the 1950s, steel kitchens were used by architects, but this material was displaced by the cheaper particle board panels sometimes decorated with a steel surface. 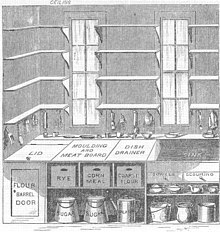 Christine Frederick published from 1913 a series of articles on "New Household Management" in which she analyzed the kitchen following Taylorist principles of efficiency, presented detailed time-motion studies, and derived a kitchen design from them. Her ideas were taken up in the 1920s by architects in Germany and Austria, most notably Bruno Taut, Erna Meyer, Margarete Schütte-Lihotzky and Benita Otte, who designed the first fitted kitchen for the Haus am Horn, which was completed in 1923. Similar design principles were employed by Schütte-Lihotzky for her famous Frankfurt kitchen, designed for Ernst May's Römerstadt, a social housing project in Frankfurt, in 1927. While this "work kitchen" and variants derived from it were a great success for tenement buildings, home owners had different demands and did not want to be constrained by a 6.4 m² kitchen. Nevertheless, kitchen design was mostly ad-hoc following the whims of the architect. In the U.S., the "Small Homes Council", since 1993 the "Building Research Council", of the School of Architecture of the University of Illinois at Urbana–Champaign was founded in 1944 with the goal to improve the state of the art in home building, originally with an emphasis on standardization for cost reduction. It was there that the notion of the kitchen work triangle was formalized: the three main functions in a kitchen are storage, preparation, and cooking (which Catharine Beecher had already recognized), and the places for these functions should be arranged in the kitchen in such a way that work at one place does not interfere with work at another place, the distance between these places is not unnecessarily large, and no obstacles are in the way. A natural arrangement is a triangle, with the refrigerator, the sink, and the stove at a vertex each. Restaurant and canteen kitchens found in hotels, hospitals, educational and work place facilities, army barracks, and similar institutions are generally (in developed countries) subject to public health laws. They are inspected periodically by public health officials, and forced to close if they do not meet hygienic requirements mandated by law. As of 2017, restaurant kitchens usually have tiled walls and floors and use stainless steel for other surfaces (workbench, but also door and drawer fronts) because these materials are durable and easy to clean. Professional kitchens are often equipped with gas stoves, as these allow cooks to regulate the heat more quickly and more finely than electrical stoves. Some special appliances are typical for professional kitchens, such as large installed deep fryers, steamers, or a bain-marie. The fast food and convenience food trends have changed the manner in which restaurant kitchens operate. Some of these type restaurants may only "finish" convenience food that is delivered to them, or just reheat completely prepared meals. At the most they may grill a hamburger or a steak. But in the early 21st century, c-stores (convenience stores) are attracting greater market share by performing more food preparation on-site and better customer service than some fast food outlets. The kitchens in railway dining cars have presented special challenges: space is limited, and, personnel must be able to serve a great number of meals quickly. Especially in the early history of railways, this required flawless organization of processes; in modern times, the microwave oven and prepared meals have made this task much easier. Kitchens aboard ships, aircraft and sometimes railcars are often referred to as galleys. On yachts, galleys are often cramped, with one or two burners fueled by an LP gas bottle. Kitchens on cruise ships or large warships, by contrast, are comparable in every respect with restaurants or canteen kitchens. On passenger airliners, the kitchen is reduced to a pantry. The crew's role is to heat and serve in-flight meals delivered by a catering company. An extreme form of the kitchen occurs in space, e.g., aboard a Space Shuttle (where it is also called the "galley") or the International Space Station. The astronauts' food is generally completely prepared, dehydrated, and sealed in plastic pouches before the flight. The kitchen is reduced to a rehydration and heating module. Outdoor areas where food is prepared are generally not considered kitchens, even though an outdoor area set up for regular food preparation, for instance when camping, might be referred to as an "outdoor kitchen". An outdoor kitchen at a campsite might be placed near a well, water pump, or water tap, and it might provide tables for food preparation and cooking (using portable campstoves). Some campsite kitchen areas have a large tank of propane connected to burners, so that campers can cook their meals. Military camps and similar temporary settlements of nomads may have dedicated kitchen tents, which have a vent to enable cooking smoke to escape. In schools where home economics, food technology (previously known as "domestic science"), or culinary arts are taught, there are typically a series of kitchens with multiple equipment (similar in some respects to laboratories) solely for the purpose of teaching. These consist of multiple workstations, each with its own oven, sink, and kitchen utensils, where the teacher can show students how to prepare food and cook it. Kitchens in China are called chúfáng(厨房). More than 3000 years ago, the ancient Chinese used the ding for cooking food. The ding was developed into the wok and pot used today. Many Chinese people believe that there is a Kitchen God who watches over the kitchen for the family. According to this belief, the god returns to heaven to give a report to the Jade Emperor annually about this family behavior. Every Chinese New Year Eve, families will gather together to pray for the kitchen god to give a good report to heaven and wish him to bring back good news on the fifth day of the New Year. In India, a kitchen is called a “Rasoi” (in Hindi\Sanskrit) or a “Swayampak ghar” in Marathi, and there exist many other names for it in the various regional languages. Many different methods of cooking exist across the country, and the structure and the materials used in constructing kitchens have varied depending on the region. For example, in north and central India, cooking used to be carried out in clay ovens called “Chulha”s, fired by wood, coal or dried cowdung. In households where members observed vegetarianism, separate kitchens were maintained to cook and store vegetarian and non-vegetarian food. Religious families often treat the kitchen as a sacred space. Indian kitchens are built on an Indian architectural science called vastushastra. The Indian kitchen vastu is of utmost importance while designing a kitchens in India. Modern-day architects also follow the norms of vastushastra while designing Indian kitchens across the world. Wikimedia Commons has media related to Kitchens. ^ "Kitchen Furniture - Europe | Statista Market Forecast". Statista. Retrieved 2018-07-20. ^ "The Pros and Cons of Using A Commercial Sink at Home - Home Decor Expert and". Home Decor Expert. 2018-06-14. Retrieved 2018-07-22. ^ "THE COMMERCIAL KITCHEN AT HOME: PROS AND CONS; BY CAROL VOGEL". Retrieved 2018-07-22. ^ Moore, Rowan (2019-01-21). "Bauhaus at 100: its legacy in five key designs". The Guardian. Retrieved 2019-01-21. ^ "World's Largest 38500-meal Solar Kitchen in India". Retrieved 2017-03-17. Cromley, Elizabeth Collins. The Food Axis: Cooking, Eating, and the Architecture of American Houses (University of Virginia Press; 2011); 288 pages; Explores the history of American houses through a focus on spaces for food preparation, cooking, consumption, and disposal.